Ryan rescued Vicky from the frenzied horse she was riding by galloping up beside her (on his horse) and vaulting on behind her and reining it in (July 1990). John Hudson and Sharlene Frame: Reacquaintance: They were reintroduced in the Frame farm kitchen by Michael. John went up to her and said something like, "Why, Sharlene! I haven't seen you since high school!" (June 1988). 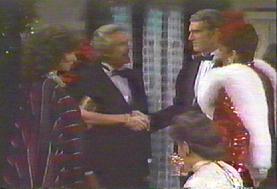 Reacquaintance: Sharlene, as Kate, introduced herself to John in the hospital solarium. (March 1994). "FF" means the meeting was freeze framed. "Reacquaintance" refers to the first meeting after a very long period, or to the first meeting that kicked off their romance. "Recast" refers to the first meeting with a recasted character.